4 Tips To keep Your Home Secure | Calgary Alarm Inc. Deterring crooks means doing everything you can to protect the exterior and interior of your house. Case in point: One study that looked at the psychology of thieves found that 94% acknowledged that they steered clear of any home equipped with a security system. So getting a system installed will go a long way towards keeping you, your family and your home safe from lawbreakers. While a home security alarm is a must, there are other things you can do to keep thieves at bay. What follows therefore are 4 tips to keep your home secure. 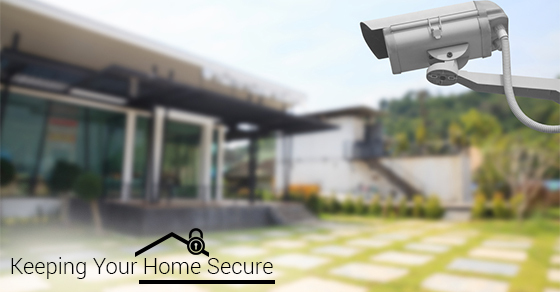 With advancements that have come in the surveillance camera space, you can protect your home with technology that provides better video quality than would have been possible previously. Being able to monitor who comes and goes from your home will make your home more secure since you’ll potentially have more time to call for help. Wired home alarm systems will do the job, but wireless home alarm systems provide better versatility. Installation of wireless systems is simpler and less intrusive since there won’t be any need to drill holes into your walls or to connect to any wiring. Furthermore, the fact that a wireless system is untethered means that would-be thieves won’t be able to disable it by cutting through alarm wires. You’ll be able to use an app on your smartphone, laptop or tablet to monitor your home remotely – and you can configure your home security system to send you alerts in specific situations like when your children enter or exit the house and when someone opens your windows. The key benefit here is that you’ll be able to keep tabs on what’s going on in your home even when you can’t physically be there. With Bluetooth technology, you can use your mobile devices to, among other things, lock and unlock your door. This technology can also be employed to connect your home to an app on your mobile devices, like a smartphone, so that you can stay on top of what’s going on in and around your home. When it comes to safeguarding your home, there are plenty of things you can do – and the cost-effectiveness of the aforementioned activities means that you can get a lot of bang for your buck. If you have any questions about how you can go about protecting your home, contact our team at Calgary Alarm. What’s The Lifespan Of A Video Surveillance System? © 2019 Home & Commercial Alarm Company - Calgaryalarm.com. All Rights Reserved.